What Is A Chromatic Guitar Tuner and Why Should You Use One? ​Whether you play guitar, bass, or just about any instrument out there, learning how to use a tuner is essential. Yes, many people choose to tune by ear, though those people are seasoned in their instruments and have heard the right notes so many times that it is ingrained in their systems. Thanks to technological innovation, we have what are called electronic tuners. These help us to tune quicker and more accurately than old school methods like tuning forks or pitch pipes. If you’re going to get a tuner, we highly recommend getting a chromatic tuner as they allow you to tune to every note in the scale, giving you wider flexibility in your sound. Today, we're going to get into the nitty-gritty of these nifty little gadgets, how they came about and why we use them. 2 Why Go With a Chromatic Tuner? 3 What Kind of Chromatic Tuners Can I Get? Tuning devices have been around for quite some time. If you look back a century ago, you’ll see apparatuses such as tuning forks. These were typically pitched to A440, or some other reference note, to use as a central starting point for other notes. Essentially, you would use these tuning forks to tune one note correctly and get the other notes in tune by referencing that one. A​fter quite a while, the pitch pipe came around. These were small, harmonica-like devices with a reed built into them. You would blow into the holes to get your reference note. The big issue with these devices is that they are pretty susceptible to damage. It’s not uncommon to get a pitch pipe that is flat or sharp by a few cents. The first types of mechanical tuners were mechanical strobe tuners. If you ever studied music at a serious music school or worked in an instrument shop, it's likely you had one of these around. Many people still use them to this day and professionals still swear by their accuracy. The only issue with them is that they are incredibly expensive and not portable in the least, as you have to keep them plugged into an outlet. ​W​hen the 1980s rolled around, electronic tuners were all the rage. It was common to see analog, VU meter-style tuners that used sweeping needles to show whether notes were flat or sharp. These tuners, as you can see in the picture below, worked in standard tunings. Essentially, you would let the tuner know what note you wanted to tune to and the needle would fluctuate to find it. Within just a few decades after that, we began seeing pedalboard tuners, microphone-based electronic tuners for acoustic instruments, and clip-on headstock tuners, the first of which being the Intellitouch PT. These devices were far more convenient for onstage use and also allowed instrumentalists to tune chromatically. This was a major breakthrough, allowing us to tune with ease, to any note, in just about any environment one could think of. Why Go With a Chromatic Tuner? So why would you choose to go with a chromatic guitar tuner? Well, why not? They cost just about the same as regular tuners and are far more versatile. Regular guitar tuners, for example, will typically only tune to E, A, D, G, B, and E. This is because most guitarists are just tuning to standard. What if you want to tune your entire guitar down a half-step? How about tuning your guitar to some weird and wacky tuning with one string on a C or F? Unfortunately, you can’t do that with your standard tuner. "Okay, well my tuner can read the note B, so I'm just going to use it to tune my low E string down to B." Regular tuners are typically made to read within specific ranges. This means that it might only be able to read the high B string in that one octave, and not anything else. Essentially, you’re reading probably won’t even show up. When it comes to chromatic tuners, you can pick from almost any note in the book as long as it is within the tuner’s range. What Kind of Chromatic Tuners Can I Get? If you’re in love with the VU meter style of tuners, yet want something more modern and versatile, we recommend going with an LCD or LED needle-style tuner. These use microprocessors to sense the incoming pitch and drive the needle closer or further from the 90-degree point to show you how your instrument’s pitch is in relation to perfect pitch. Do note that these can either be found in chromatic tuning or standard tuning, so it is important to read manufacturer specs before purchasing one to make sure you know what you’re buying. If you’re a gigging guitarist or bassist, you’ll likely want to get a pedal or stompbox-style chromatic tuner. These come with both ¼” inputs and outputs so that they can have signal routed into them and then signal routed out into other pedals or amplifiers. Chromatic pedal tuners will typically use some sort of LED display, and depending on the one you get, can have different modes including strobe mode, needle display, etc. Clip-on tuners are easily some of the most versatile and innovative chromatic tuners on the market, as they can pretty much be used on any instrument. Stick one on the headstock of your guitar or the bell of your trumpet and let the tuner feel the different vibrations. The one great thing about these clip-on tuners is that they don’t pick up background noise, allowing you to tune in the noisiest of environments. 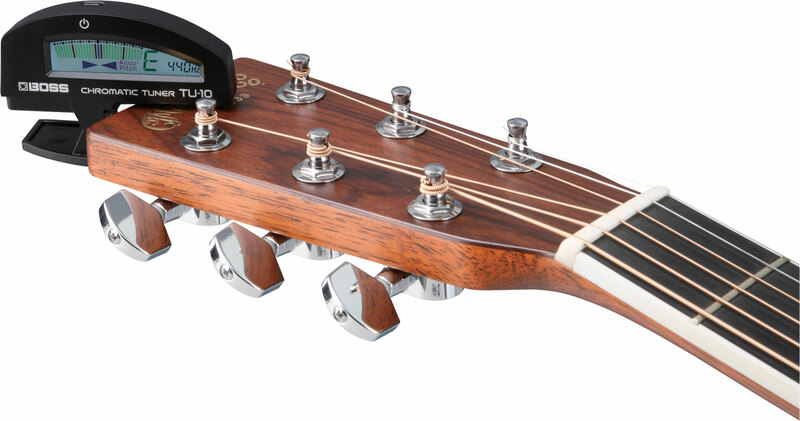 Chromatic tuners are one of the most significant innovations in tuning technology. They can be used by just about any musician and allow them to alternately tune to their heart’s desire. With that said, there are hundreds of different chromatic tuners on the market, each claiming to be the best. We recommend checking out companies like Peterson, Korg, Snark, TC-Electronic, and Intellitouch if you're looking for a serious chromatic tuner. The design that you choose is entirely up to you! We hope that you learned some valuable information today on why you should have a chromatic tuner in your possession. They are invaluable tools that greatly expedite the parts of making music that isn’t so fun.